At Clover Hill Farm, we specialize in caring for horses. 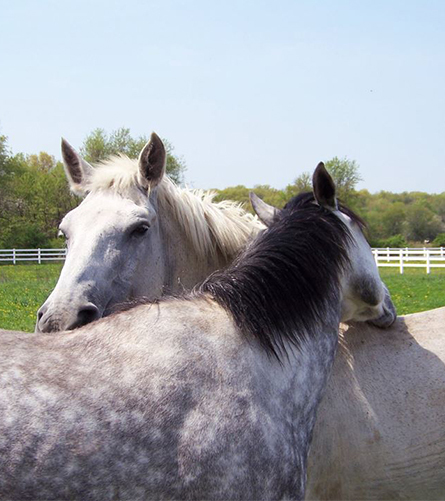 Our Wallkill, New York, facility offers horse boarding, rehabilitation for horses recovering from an injury, broodmares, retirement boards, and much more. To ensure your treasured horse receives the best care, count on us. Turn-out board is $325 per month. 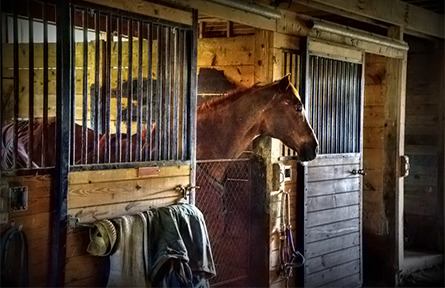 The horses live outside with a run-in shed. They get grain twice a day, unlimited hay/grass and water. Full board is $450 per month, and these horses are outside most of the day and in at night. They are fed grain in the morning, turned out, and have access to grass/hay all day before being brought in for grain and hay. Turn out schedules can be adjusted to your horse's needs. When your horse is recovering from an injury or illness, our dedicated team will nurse him or her back to health. Your horse will be walked every day, and any extra attention necessary will be given as needed. We also administer all medications and work hard to help horses who are recovering from a surgery. If you have horses you keep for breeding, we can board them and assist you in the process. We have special, larger stalls just for broodmares. Our staff of professionals has the training, experience, and compassion necessary to properly care for your mare and the foal once she has given birth. Count on us for quality, compassionate care for your horses. Grooming, exercising, and other services are available at an additional cost. Grooming includes brushing, bathing, and hoof picking, while exercising includes lunges and 45-minute to one-hour rides, depending on your requests. "One of the best farms in the Hudson valley! Be sure to visit if you are in Wallkill. Meticulously maintained Equestrian facility. The sunsets from here are out of this world!"